Set a 10- to 12-inch skillet over medium-high heat. Add oil and 1/2 tablespoon butter; once melted, swirl to coat pan. Add mushrooms and cook, stirring occasionally, for approximately five minutes or until mushrooms give off liquid. Increase heat to high and stir frequently until liquid has completely evaporated. Add remaining 1/2 tablespoon butter to pan, and stir and cook until mushrooms are tender and browned, about five minutes more. Add garlic to pan and stir constantly for about 30 seconds, or until garlic becomes aromatic but not too dark. Season mushrooms with salt and freshly ground black pepper and transfer to a plate, draining on a paper towel if they seem too oily. Lay out two tortillas on a cutting board. Sprinkle EACH tortilla with 1 ounce of shredded cheese, 1/2 ounce spinach, 1/2 of the cooked mushrooms, 1/2 of the sliced avocado, and final 1 ounce of shredded cheese. Lay the remaining tortillas on top. Transfer an assembled quesadilla onto the skillet. Cook for a couple of minutes, occasionally lifting edge of quesadilla to check color of underside, until tortilla begins to turn golden and cheese starts to melt. 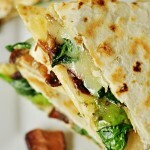 Carefully flip quesadilla over and cook for another couple of minutes or until cheese is fully melted. Remove hot quesadilla to a plate and repeat with second quesadilla. Alternatively, you may cook both quesadillas at the same time on a flat griddle. Slice each quesadilla into 6 wedges and serve hot.